Stress incontinence isn’t a topic that often comes up in casual conversation. However, if you’ve ever found yourself amongst a group of moms chatting about life, child rearing, post-pregnancy fitness or aging, it’s likely that someone will eventually crack a joke or share an anecdote about that time when they, or someone they know, sneezed or laughed and were shocked by a little surprise leak. Once that first brave soul shares, we all laugh along and sympathize, because a lot of us can really relate through personal experience. Humour is a great way to talk about difficult topics, and stress incontinence is a difficult topic for sure. 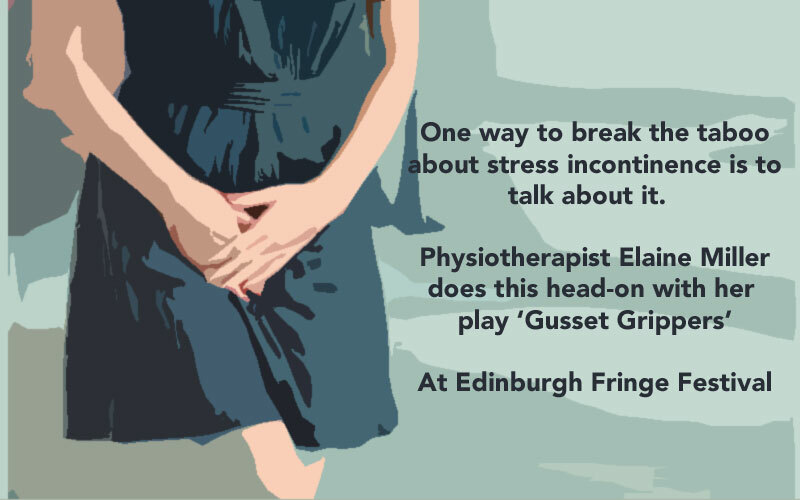 Physiotherapist Elaine Miller has taken pelvic floor humour to the stage with her play ‘Gusset Grippers‘, running at the Edinburgh Fringe Festival this year. She wants people to know that they don’t have to live with stress incontinence – there is a simple, effective treatment (ie. physiotherapy) available to combat the problem. She figured the comedy stage was the perfect place to call out the taboo topic to address it head on, laughing along the way. As Miller notes, “Making socially cohesive groups guffaw about awkward topics makes them talk, share experiences, gain empathy and, hopefully, encourage each other to seek help.” Her hope is that the audience will leave knowing more about the pelvic floor and where to take theirs for help if they want to laugh without leaking. Gusset Grippers is gripping audiences, as the play sold out in 2016 and won ‘Weirdest Show of the Fringe 2013’. It’s awesome to be educated and entertained at the same time, and apparently this show includes a sing along and some trivia games to boot. With personal experience and professional expertise Ms. Miller has found a great way to create more awareness and conversation about the difficult topic of stress incontinence.